Fibonacci Retracements are one of my favorite trading tools. The levels predicted by the tool are remarkably accurate and provide a great number of trading opportunities for me in my day to day routine. The thing is, Retracements are best used when dissecting a pronounced trend or sharp movement in stocks so they are not neccesarily the first thing you would turn to as a day trader. Why is this, simply because the day to day movement of any one asset, particularly a forex pair, is not that great. To understand let’s touch base quickly on what Fibonacci Retracements are. They are price levels determined by the Golden Ratio as laid out by the famed mathematician Fibonacci. 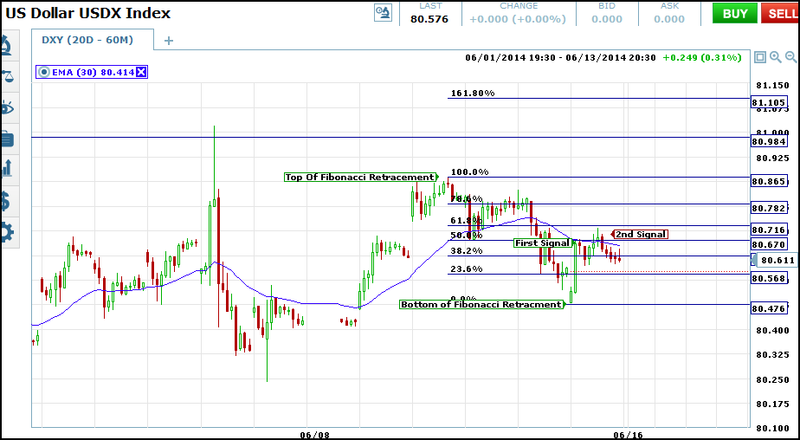 The levels are percentages of a given price movement and are a useful as target areas for entry points. This tool is commonly available as a standard feature of most charting packages and comes with a few variations. Typically I would draw retracements on a chart of weekly or daily prices and then use those levels as potential areas for continuation or reversal. This method doesn’t provide a whole lot of entries for day traders but there are two methods of using Fibonacci that do. Warning! Fibonacci Retracements are not signals, they are target areas where a signal may occur. Trading simply because price has reached a retracement level is not a sound method. Other signals indicating direction and duration are required before trades can be taken. Believe it or not I just made up the name of this strategy but the strategy itself is old, very old. The Long Bar Method targets specific days and is not for use on a day to day basis, unless of course the asset you are trading is volatile and makes a lot of wide swings. For this method to work you need to be patient and wait for a day when news, a technical break out or some other event causes the market to make a much larger than normal daily movement,say in the range of at least 1% or better. The bigger the day the better because you can expect the bounce back from that day to be stronger than on an average day. Once you have identified a day as a potentially good one draw (on the daily chart) a Fibonacci Retracement from the high to the low of the day; if it’s an up day from the low to the high, if a down day from the high to the low. Once this is done you can move down to a chart of hourly, 30 or 15 minutes as you prefer. Then as price bounces, or retraces, its way you can use the Fibonacci Lines as target areas for signals. One note of warning, there is not always a snap back following a major market movement. If a rally is strong then there might be two or three days of upward movement or more before any kind of a snap back occurs. The same is true in a strong bear market. If this happen then you can draw your retracements for the entire movement, not just the one day. This strategy works best when the market has made a major movement in the magnitude of 1% or more. Knee jerk reactions to bad news and speculative rallies on good news are two such events. Any time the market makes a significant movement a Fibonacci can be applied to that day or week. For this method I suggest that you use a chart with 30 or 60 minute candle sticks. This is a good time frame for watching the day to day swings in the market and for using Fibonacci Retracement. This method is also more useful for the average day trader as it can be used any day, not just after a strong market movement. To apply it, pull up a chart of 30 or 60 minute prices and then apply a Fibonacci to the most recent trough and peak. It does not matter if it is drawn from a peak to a bottom or vice versa as this is not a trend following technique. With this we are simply trying to find appropriate areas where a signal, any signal, can be found. Look at the chart below. I have drawn a Fib from the top of an intraday peak to the bottom of an intraday trough. The Fib tool provided several levels where signals might form. The bounce back was strong enough to blow through the first two retracement levels but gave an early signal at the 50% line. Then a second signal, a much stronger and tradable signal, forms from at a place where put trades could have been taken. One note of warning, day to day market moves are highly susceptible to news and other near term market moving events. These can have an adverse affect on your trading if unprepared. Always check the economic and earnings calendar before entering a trade.